I first noticed Hairy Records when there was a feature on BBC'S The One Show which discussed the charms of this quaint old record store and stated that this was the UK's oldest record store! The store truly is a gem which proudly fits in as part of Liverpool's phenomenal musical heritage. I cannot pretend to be a vinyl expert or even someone who is a great musical muse but Hairy Records not only captured my imagination but the true spirit of Liverpool's music scene. 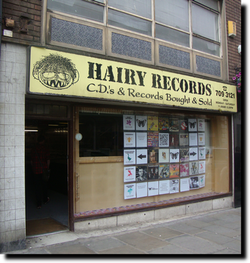 Hairy Records wasn't always Hairy Records...............The shop on Bold Street that was originally under the hairdressers Voodo was at 98a. That was originally a store room for Home & Bargain. It was originally opened as BIG T records in the early 90's with the owner, a guy called Tommy moving his shop to Bold Street from what was then the Liverpool Palace on Slater Street - it took a few weeks kitting the shop out - I know, I did it ith him!! A few years later, the shop was bought by a guy called Bob and this later became known as Hairy Records. Bobs shop was originally in the Liverpool Palace too. As for it being the oldest record shop in Liverpool - not a chance! comment :Frank Cannon. (Nov 4, 2013) Terry said:I was in Liverpool in September and Hairy looked to be shut down.